Samsung Galaxy S6 and the Galaxy S6 Edge are yet to come in markets internationally – you can, however, pre-order these devices. Check our comprehensive post on best deals that you could get on different variants of this Galaxy S6 duo. But for those who can’t afford to throw in so much money on these new gadgets, here is the good news! You can get last year’s Samsung flagship smartphone and the Galaxy Note 4 on some pretty awesome discounts. Here are the details of the some of the first deals being offered starting this weekend. Keeping in mind that everyone is raving about the latest Samsung Galaxy S6 duo, it is only evident that the sales would drop tremendously for previous Samsung devices. Retailers have hence started to offer some major discounts even before the sale of Samsung Galaxy S6 and Samsung Galaxy S6 Edge starts. 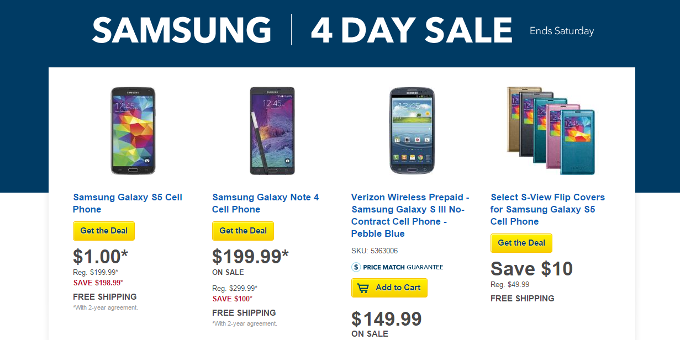 Here is one of the first deal that is being offered by Best Buy on Samsung Galaxy S5 and the Samsung Galaxy Note 4. Galaxy S5 discount: Best of these discounts is on Samsung Galaxy S5 – you can now get it only for $1 on a 24 months contract. Save $100 on Samsung Galaxy Note 4 on a 24 month contract – you’ll be getting it just for $199.99. Get $100 off on Samsung Galaxy Tab Pro 10.1 – now only for $299.99. Samsung Galaxy S3 is now being offered for only $149.99 on a limited time offer. Check more details on Best Buy. If you are interested in buying the latest smartphones from Samsung, check our post: Buying Samsung Galaxy S6 or Galaxy S6 Edge? Here are Some of the Best Deals for UK. You can find some good deals from O2, CarphoneWarehouse, Three, Tesco Mobile, Vodafone, and other carriers and retailers.